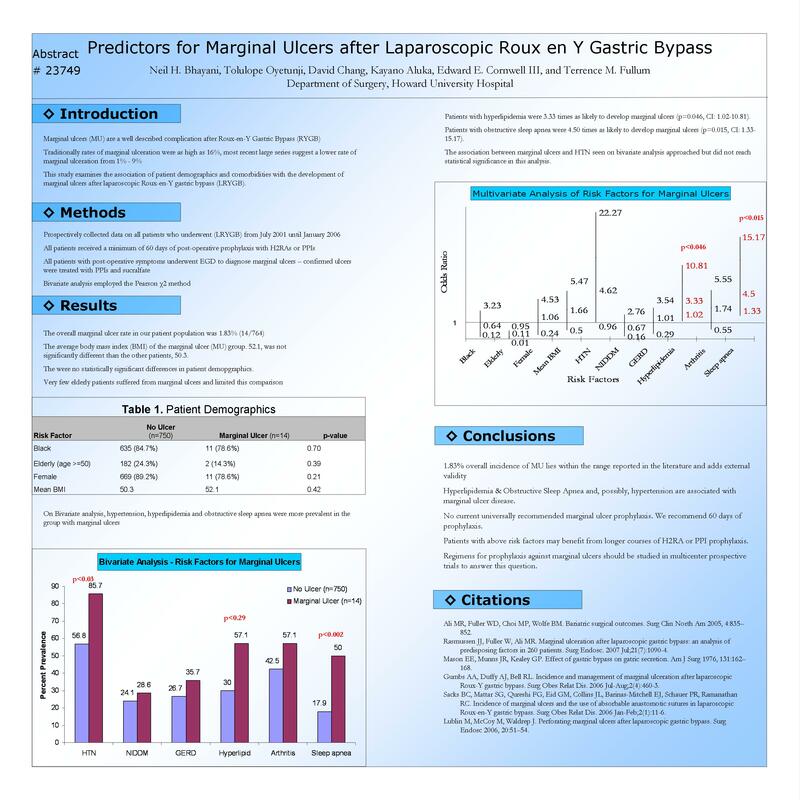 BACKGROUND: Marginal ulcer formation after Laparoscopic Roux en Y Gastric Bypass (LRYGB) is a known complication. Few studies have clearly identified risk factors and recommendations for prophylaxis have been controversial. METHODS: From July 2001 until January 2006, 764 patients underwent LRYGB for morbid obesity. Prospectively collected data were reviewed and demographic information, co-morbidities, and Body Mass Index (BMI) were retrieved. Bivariate analysis was performed to determine the association between each pre-operative factor and the occurrence of marginal ulcers. Multivariate regression was then performed adjusting for demographics, BMI, and co-morbidities. RESULTS: Fourteen of the 764 patients developed marginal ulcers (1.83%). From the bivariate analysis, patient demographics were not significant predictors for the development of marginal ulcers. Patients with marginal ulcers were more likely to have hypertension (85.7% vs. 56.8%, p=0.03), hyperlipidemia (57.1% vs. 30%, p=0.029) and sleep apnea (50% vs. 17.9%, p=0.002). Multivariate analysis showed that patients with hyperlipidemia were 3.33 times more likely to develop marginal ulcers (95% CI: 1.02-10.81), while the odds of marginal ulcers in patients with obstructive sleep apnea quadrupled (OR: 4.5, 95%CI: 1.33-15.17). CONCLUSION: Our data suggests that a subset of the bariatric population having the co-morbidities of hyperlipidemia, sleep apnea, and hypertension may have an increased risk of developing marginal ulcers. Consideration should be given to implementing ulcer prophylaxis in these subsets of patients.